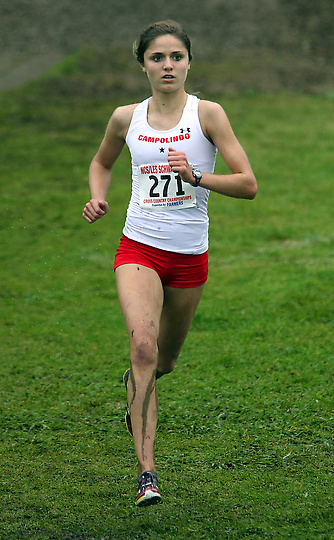 Today we chat with Campolindo HS junior, Brighie Leach (picture to the left courtesy of www.campotrack.com). She led her teammates to the team title in the Division III race at this past Saturday's Stanford Invitational by winning the race in a controlled 18:17. Campolindo finished as the 4th fastest team overall and will be one of the favorites to get on the podium at the state meet. Leach won last year's NCS MOC in the 3200m. with a lifetime best time of 10:41.05 to qualify for the CA state meet. She is currently undefeated following her victories at the Ed Sias Invitational, DFAL #1 and the Stanford Invitational. Coming from a different middle school than most people at Campo, I thought cross country might be a good way for me to meet some people before I started high school. Before I became a distance runner I played club soccer for 7 years and was a competitive Irish Dancer since the age of 5. 2) What was the first success that you remember in the sport that really motivated you to put more of an effort into XC and TF? I don't remember one single "success" that motivated me but the combination of making varsity as a freshman and being surrounded by such inspirational and talented athletes made me especially determined to work hard and live up to Campolindo's high standards. 3) Where do you feel you made the biggest jump in terms of your training and times? In September of my Sophomore year I was diagnosed with severe anemia. Once I got that under control, I definitely saw some major improvements in my times. 4) Tell us a little about your freshmen and sophomore cross country seasons and what you learned from those experiences. Highlights? My freshmen year started well but certainly didn't end the way I hoped it would. When we got to the state meet at the end of the season, our team had our hopes set on winning the meet. However, things didn't work out in our favor and I finished the race (and my freshman season) by crawling across the line. I wouldn't find out until about 9 months later that this happened because I was already suffering from anemia. My sophomore year, however, ended on a much happier note. After a rough start and a tough battle to increase my iron levels, I came back to the State Meet to place 13th in Division 3 and an improvement of over 3 minutes from the previous year. I came close to quitting cross country at the beginning of sophomore year but choosing not to give up has got to be one of the best decisions I have ever made. 5) What about your sophomore season on the track? What do you feel was your best race of the season? My best race of the season was at NCS Meet Of Champions in the 3200m. I won the race in 10:41 which was a 19 second PR and qualified me for the State Meet. 6) What did you do differently this summer as you prepared for your current season? This summer I ran lots of long runs (I ran for 2 hours straight for the first time which was surprisingly not as painful as I thought) and focused on running high mileage to get a solid aerobic base for the season. 7) What do you feel are the key workouts for you that give you the most confidence going into your races? The workouts that always give me the most confidence are tempo workouts. Clocking negative splits on a long workout gives me a huge confidence boost because it reminds me that no matter how tired I am there is always something left for me to give. Chuck is a fantastic coach and I am so grateful for all the work and time he puts into our program. His focus on improvement and dedication allows every athlete on our team to feel successful. He has taught me to be consistent in my training, smart in my races but, more importantly, he has helped me learn to love running. 9) Favorite XC course? Favorite XC Invite? Favorite XC workout? Favorite Campo XC tradition? Favorite Track Invite? Favorite Track event? Favorite track workout? Favorite opponent(s)? Tradition: Every year we have an Orienteering Race and it's pretty funny to watch a bunch of high school kids sprinting around a park (often wearing some interesting costumes) frantically searching for clipboards that are hidden in random locations. 10) What do you feel you learned the most from your time on the team with Carrie Verdon? Being on a team with Carrie Verdon was pretty cool. Everywhere we went people seemed to know who she was and one time a photographer from a running magazine even came to Campo just to take pictures of her while she ran. She was probably one of the most talented athletes I will ever be on a team with but I think one thing that will always stick with me about her is her favorite quote: "Pressure is just the shadow of great opportunity". It's something that I've started to remind myself of lately to calm my nerves before a big race. 11) What is your advice for a young talented runner with goals of eventually competing with the best runners in the state? Enjoy every minute of every run because running is awesome. And remember that, in the end, few people care as much as you do about your time and place so just relax and run for yourself- don't worry about anyone else. I'd just like to give a quick shout-out to my amazing teammates who have helped me through all the rough patches and tough workouts and made me love running as much as I do. Also, thank you to my parents for being super supportive and helping me stay sane through all the craziness. View Brighie's sterling XC and Track & Field career here.